The Trippler is the perfect compact tripod/grip/pole combo that compacts down small enough to carry with you every day. The Trippler allows users to set up the perfect shot every time without having to hold a selfie stick, or ask someone else to take it. 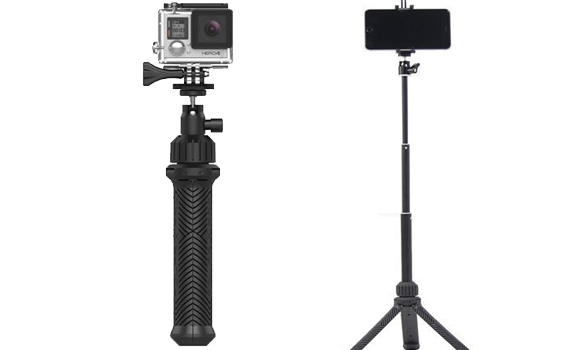 Included with each Trippler are mounts compatible with cell phones (Up to iPhone6 Plus w/case), GoPro cameras, and standard tripod mount cameras. The Trippler extends from 19 to 71cm (7.5 to 28 inches) both in the tripod and extension pole state. Constructed out of aluminium, glass filled nylon, and rubber; the Trippler is one of the most solid compact tripods on the market. Take a Trippler with you on your next adventure and capture the most epic pictures possible.